Well, according to Cook's PVI, it is the fifth most liberal state in the country (behind DC, Massachusetts, New York, and Rhode Island). But that's not all! My home district, the 8th, is rated D+20 ... which makes it only the third most Democratic district in the state (MD-04, D+30; MD-07, D+25). Even Massachusetts has only one district bluer than that. This weekend, it is rumored that Chicago will see temperatures upwards of 50 degrees. Obviously, this disgusts and sickens me, so I am fleeing north to Minnesota to attend a ball with a certain lovely lady. Hence, the usual tide-you-over roundup (I'll be back Monday evening). Ta-Nehisi Coates links his positive perception of Jews and Blacks "who shot back" as a counterweight to the prevailing narratives of both people: namely, passive victims who got beaten up a lot. A good breakdown of the factors in play in Israel's upcoming election. Marcia McCormick on why Ledbetter won't accomplish much. Depressingly convincing. The South African President has reportedly dressed down Fatima Hajaig, and the Jewish community has now indicated that it fully accepts her apology (after previously rejecting it as "veiled"). Hajaig will keep her post in government; no word on whether the complaint against her to the state's human rights commission will continue. If there is anybody I trust for serious economics expertise, it's the trifecta of Michelle Malkin, Glenn Reynolds, and Joe the Plumber. Juicy Campus down, far too much sludge to go. There is a theory amongst policy debaters that if a given proposition yields benefits of even one cent, it should be supported because it is a marginal gain over the status quo. Under the most generous interpretation, we can say the Israeli government must have taken this theory to heart in approving a settlement "swap". Defense Minister Ehud Barak has agreed to approve the establishment of a new settlement in the Binyamin region in return for settlers' agreement to evacuate the illegal outpost of Migron. The Migron settlers will move into the new 250-house settlement after leaving the illegal one they built on private Palestinian land. The new site is a kilometer away from the built-up section of the Adam settlement, located east of the separation fence. The establishment of the new community violates the conditions of the Road Map, as well as Ariel Sharon's commitments to President George W. Bush in 2003. I guess that if everything goes off without a hitch, yes, this is marginally better than the status quo -- an isolated settlement replaced by one near a major bloc (consolidation is good), and a settlement built illegally on Palestinian land replaced by a settlement built "legally" on (hopefully) open territory. But seriously, come on. When it comes to settlements, the Israeli government does not need one for one swaps. It needs to start paring down. Drastically. The Migron settlement was already scheduled to be evacuated back in August of 2008. Now, not only is it being replaced by a shiny new settlement, but the evacuation date has been pushed back for two to three years. And, as Peace Now representatives noted, experience tells us that when two or three years rolls around, there will be another reason to keep the Migron settlement up anyway, and in fact what we'll see is a net increase in settlement presence. Justice Ruth Bader Ginsburg is being treated for recently-diagnosed Pancreatic cancer. The cancer was discovered early, but obviously as a prior cancer survivor Justice Ginsburg's risks are heightened. Hopefully, she'll overcome this one as well -- I've been looking forward to many more years with her on the bench. Pope Benedict has made an abrupt turn-around on the Richard Williamson scandal, demanding that he repudiate his Holocaust-denial if he is to be readmitted into the church. This comes after a furious reaction by the Jewish community to the rehabilitation of Mr. Williamson, who was to be readmitted to the Catholic religious body as a gesture of reconciliation with its radically conservative wing. Previously, the church had brushed aside the outrage, with Vatican secretary of state Cardinal Tarcisio Bertone saying he considered the matter "closed" after Benedict denounced Holocaust deniers last week. It is good to see the Vatican take this step. It would have been better if they hadn't so badly screwed up in the first place, then tried to airily dismiss the legitimate complaints of the Jewish community. But late is better than never. It'll be interesting to see what Williamson does. UPDATE: Ohhhh! Katz = Cats. I totally missed it. Seriously, I did. So, not anti-Semitic (really), just completely unoriginal and unfunny. But that's nothing new for Marmaduke. Someone today, who will not go named because she's applying for jobs and needs to preserve her reputation, told me that she likes the comic strip Marmaduke. Now, that's rather abhorrent on its own, as every Marmaduke strip boils down to "Marmaduke is a big dog. Sometimes, he interacts with his owners and guests in a creepy over-sexualized fashion." But today's Marmaduke, while nodding in the direction of the form, takes the strip in a whole new (well, not whole new) direction -- anti-Semitism! It's not just that one could interpret Marmaduke's refusal to stop at Katz Deli as a boycott of Jews, so much as I can't think of any other way the caption makes any sense at all. Of course, my friend didn't read Marmaduke today, so I'm sure this wasn't a commentary on her. But seriously -- what am I missing here? 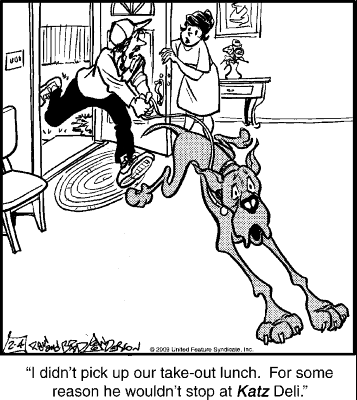 What is the punchline of this joke aside from "even Marmaduke wouldn't eat at a deli named Katz"? Have I Got a Theory for You! Although we all support an independent, viable and sovereign Palestinian state in theory, I find Clinton’s remarks terribly naieve. Mr. Van der Galien's support is so abstract that he thinks even those who agree with his position are naive. Now that's what I call theoretical! The point Mr. Van der Galien tries to make is that Hamas and Fatah are mortal enemies who, whenever they are put together, are at each others throats. That, indeed, is an obstacle to establishing a viable Palestinian state, though I'm not sure that makes the goal of it "naive" so much as it identifies a barrier that America will have to keep in mind and work through in our diplomatic engagement. But also, I'm at least a little confused as to why the Hamas/Fatah conflict really undermines the case for establishing a Palestinian state. That is to say, I'm not sure what "bad things" that flow from the Hamas/Fatah conflict become worse because their battle is in the context of a sovereign state rather than as an occupied pseudo-government. Either way, Palestinians will suffer from the conflict, either way, Israel risks being bloodied by the spill-over of the clashes, and either way, there is some incentive to gain popularity by ratcheting up violent attacks against the Israeli state (though I imagine the last of these, at least, would be reduced in a statehood context). One might also hope that the domestic pressure to actually run a new country might put enough leverage on the two to put aside their differences at least for the short term and try governing for awhile. But that's neither here nor there. The fact that getting a viable Palestinian state off the ground might be hard isn't a good reason to remove that end-state as an objective. A "theoretical" support for a Palestinian state that is so thin that it mocks anyone else who registers similar support is the essence of a facade. If you're not willing to work at creating a Palestinian state, you're not in favor of one -- "theoretically" or otherwise. They'd hate to be left out. Our global anti-Semitism tour has hit Europe, Africa, and South America so far. And now, representing the continent of Asia ... Bangladesh! As reported by the editor and publisher of the Weekly Blitz, peace activist Salah Uddin Shoaib Choudhury, Mohammad Asafuddowlah said, "My soul bleeds when I recall the recent atrocities against the people of Gaza. And if I was a young man, I would have gone to Gaza with a weapon to exterminate Israel." It is not just Israel's extermination Asafuddowlah seeks, however. "Now I believe that what Adolph Hitler did during the Holocaust was absolutely correct. He should have done this more extensively, to eliminate the total Jewish population from the world," he added. Abdul Hye Sikder, the host of the TV program on which Asafuddowlah appeared, reacted to the genocidal statements with agreement, echoing the sentiments. Sikder, Choudhury reports, was at one time a leading activist of the Bangladesh Nationalist Party. Incidentally, the BNP is a conservative (center-right) party, so at least this one can't be blamed on the "left". But the lamentations about Hitler's failures are unfortunately becoming a bit of a trend. I have just returned from a visit to Japan and learnt of the controversy surrounding some comments that I was purported to have made. I have reviewed the proceedings of the meeting and wish to say, to state the following: Throughout my life I have been opposed to apartheid and all forms of racism. It is this opposition that drove me into exile and to work with the African National Congress for decades. Along with all in the ANC and consistent with the recent resolutions adopted at our Polokwane conference in December 2007, I have long been cognisant of the immense suffering the Palestinians have experienced in the form of expulsions, collective punishment and massacres, of which the recent war in Gaza is but the latest example. It is to this suffering that I spoke at the meeting. I deplore the attempts of Zionists to justify policies that have worsened the crisis in the Middle East, in particular unmitigated state violence directed against unarmed civilians as much as I deplore indiscriminate attacks against Israeli unarmed civilians. At a singular point in my talk, and entirely unrelated to any South African community, I conflated Zionist pressure with Jewish influence. I regret the inference made by some that I am anti-Jewish. I do not believe that the cause of the Palestinians is served by any anti-Jewish racism. As a member of the South African government and a committed member of the African National Congress, I subscribe to the values and principles of non-racism and condemn without equivocation all forms of racism, including antisemitism in all its manifestations and wherever it may occur. To the extent that my statement may have caused hurt and pain, I offer an unequivocal apology for the pain it may have caused to the people of our country and the Jewish community in particular. I wish to reiterate that the major issue in relation to the Palestinian Israel conflict is the enormous suffering of the Palestinian people and the struggle for peace for all its’ people based on justice and security for Israelis and Palestinians alike. As Deputy Minister of Foreign Affairs, I reaffirm the government’s commitment to engage all parties in Israel and Palestine to find an amicable and just resolution to the conflict in that region. Wow. It rare to see an "apology" that nearly matches the original statement in terms of its offense, but God bless her Ms. Hajaig gave it her best shot. First of all, let's note something very important here. In an "unequivocal apology" to the Jewish community, the amount of time she spends talking about the offense and anti-Semitism is outweighed by at least a 2:1 margin by her "reiteration" of her pro-Palestinian position. The entire first paragraph, for instance, and much of the second and third. It's a strange sort of apology whose primary purpose is to reiterate a political position, rather than give redress to the aggrieved. Second, notice how even her "apology" is framed in terms of what it means to the Palestinian people. Indeed, she barely is addressing South African Jews at all. "I do not believe that the cause of the Palestinians is served by any anti-Jewish racism." I happen to agree, but even if anti-Semitism was the best thing to happen to the Palestinians since sliced bread, it'd still be wrong. But it is beyond obvious that Ms. Hajaig thinks the real problem here is that she might have given the Palestinian solidarity movement some bad PR, and that's what she is trying to mitigate. The nod to Jews is almost entirely perfunctory. Third, for an "unequivocal" apology, it sure is ... equivocal. As far as Ms. Hajaig understands it, the mistake was that she "conflated Zionist pressure with Jewish influence." As I've remarked, if she said "Zionist" instead of "Jewish", would it really have been better? Do you think it would have been interpreted differently? As the Z-Word bloggers put it, "instead of the word 'Zionist' being used as deliberate code for 'Jew,' the word 'Jew' is being - accidentally? - used as code for 'Zionist.'" It's bizarre, and it's even more bizarre that this is supposed to represent an explanation. Likewise, she regrets "the inference made by some that I am anti-Jewish." Oh, suddenly this is my fault? She's sorry I inferred she was anti-Jewish? She also apologizes "unequivocally" for the "hurt and pain" her statement caused. What's missing is the idea that the statement itself was wrong. It's not just wrong because it hurts Jewish feelings. It's wrong because it was vile, reactionary, anti-Semitic, and unbecoming of a member of a liberal democratic government. It's wrong because it was an expression of anti-Jewish racism, not an "inference" of one. And yes, it'd still be wrong if she had subbed in "Zionist" and gotten her code right the first time around. Fourth, there is no indication she, you know, learned anything from this. In the first paragraph, she talks how she has "long been cognisant of the immense suffering the Palestinians have experienced". The right move to make from that line is to say "I have not similarly been aware of the depth of Jewish feeling on this subject, or the historical and continuing prejudice which I tapped into when making my remarks. I commit myself to rectifying that gap immediately." But that, of course, is roughly the opposite of how her statement progressed. Indeed, there was no indication that Ms. Hajaig feels it necessary to engage in any sort of introspection (much less engagement with the Jewish community) at all. She just blandly affirms that she is opposed to anti-Semitism (if for no other reason than it's bad for the Palestinians), then pivots right back to saying that the main issue is how much the Palestinians are suffering. This isn't an apology. It's a second insult, or it's a joke. Either way, it's past time Ms. Hajaig tender her resignation. Maybe she'll finally find the time to do the soul-searching that she so desperately needs if she wants to continue to call herself a progressive anti-racist. This picture, of Hillary Clinton being sworn in as Secretary of State, comes from this CNN article detailing her first overseas trip to Asia. But that's not what I want to focus on. Look at Bill. Look at how he looks at his wife. There is tremendous pride there. And tremendous love. Bill Clinton and Hillary went through some horrible experiences in their marriage because of some of the reckless behavior that he has admitted he had. I am not defending him on that, it’s indefensible. Just let’s not let it get lost on us that they kept their marriage together. They raised a magnificent daughter. Chelsea is truly a delightful human being…She’s polite, thoughtful, intelligent and everything you would hope a daughter to be. But they kept their marriage together. And a lot of the Republicans who have condemned them and talk about their platform of family values, interestingly, didn’t keep their own families together. Give Bill and Hillary Clinton credit for doing something we say they should have done and that is hold their marriage together in spite of enormous trials. I don't believe, as I imagine Huckabee does, that divorce is always a bad thing. Sometimes, marriages don't work out. Sometimes, it's better for both persons if a couple splits. Sometimes, it doesn't matter if it's better for "both" persons or not -- a marriage can poisonous to one party, and they deserve the right to leave if that's the case. However. The Clinton marriage has always been presented as two people who could barely stand each other, going through the motions to nurse their respective egomaniacal ambitions. I'm sorry, but I just don't see it. I don't. I don't see them as a couple that should have split up, and is only staying together for appearances sake. Everything I've observed about Bill and Hillary Clinton together has demonstrated a couple that is fiercely loyal to one another, that has genuine affection for one another, and that will back the other one up no matter what. Bill Clinton's behavior was often inexcusable, but they worked beyond it, because I really think they love each other. Sometimes Bill was a little aggressive on the campaign trail -- more than I'd like -- but that's because he wanted to do everything he could to help his wife in her effort to become President, and sometimes passion makes one a little hotter than one perhaps should be. As an Obama supporter, I can forgive that. 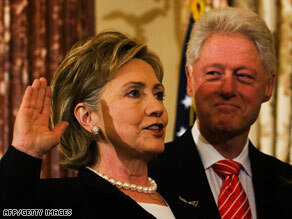 The Clinton marriage, as I see it, is a relationship of two extremely smart, extremely committed public servants who have gone through a lot together, seen some successes, made some mistakes, and through it all, still support each other and care about each other in a deep and fundamental way. I like that in a marriage. SEE ALSO: Hillary Clinton's swearing-in ceremony. Ta-Nehisi Coates had an interesting response to new RNC chair Michael Steele's now infamous remark to Barack Obama: "How do you like me now?" And I think Obama follow that up with: Chairman Steele, Play your position. You lost a senate race in one of the blackest state's in the country, after a particularly racially divisive Democratic primary. Obama is a black Democrat who just won Virginia and North Carolina. At least Mel Martinez had won an election. What's that Clips lyric? You are not him. We generally believe that black conservatives have chosen that path in order to take the fastest route they could find to fame, money and power. If it means selling the rest of us down river, so be it. However, the GOP's real problem with black people is not so much that the white conservatives in the party do not reach out to blacks, but that so-called black conservatives do not do enough outreach to black voters. Black conservatives as a group, particularly the prominent intellectuals, seem to go out of their way to attack the black community. Consider conservative author Star Parker’s intellectual meditations titled, Pimps, Whores, and Welfare Brats or Uncle Sam’s Plantation. Ouch! Most black conservative commentators are largely viewed by blacks as opportunistic, attack dogs for the white conservative establishment. This perception is entirely unhelpful in a community that understands that its core interests are in equal access and opportunity, health care and community redevelopment. In short, black conservatives often can't get a hearing on important issues among blacks because they have positioned themselves as hostile to the interests of black people. The black members of the GOP rarely, if ever, stand up and speak out when the party does the wrong thing. Where are the black conservatives when Rush Limbaugh says, “We are being told we have to hope he succeeds, that we have to bend over and grab our ankles ... because his father was black, because this is the first black president, we've got to accept this”? Limbaugh is out of control. He is being overtly racially offensive and both black conservatives and the Republicans in Congress are terrified to denounce him publicly. As long as the blacks who self-identify as “conservatives” continue to lay down for this nonsense, and continue to attack and alienate themselves from their own community, instead of reaching out, listening and building coalitions within the black community; black voters for the foreseeable future will continue to reject the Republican Party and black conservative ideology. It's a bit unfair to group Steele in this -- The Root piece I linked to noted the same instance I did where Steele justly flamed Republican "outreach" to Black voters. But at the same time, Steele has not been particularly willing to buck the cryptoconservative wing of his party which is nearly entirely predicated on denigrating and diminishing Black people. "We condemn the actions on the synagogue of Caracas," Chavez said in a televised speech on Sunday. "It must be asked ... who benefits from these violent incidents. It is not the government, nor the people, nor the revolution." In an often cryptic response, he suggested opposition leaders plotted the attack to reduce his chances in a February 15 referendum on a constitutional amendment that would let him stay in office after his term ends in 2013. Nobody "benefits" from these violent actions. But somebody does inspire them. And that someone is Hugo Chavez. UPDATE: Modern Mitzvot has more. A post by Dylan Matthews, guest-blogging for Ezra Klein, has been nagging at me for a couple of days now. Netanyahu's policy position here is based entirely on negatives. He doesn't want to divide Jerusalem, even though annexing East Jerusalem is illegal and would cripple the Palestinian economy. He doesn't want a return to 1967 borders, even though that would secure Israel recognition from the entire Arab League. But the problem isn't just that the planks are wrong. It's that they're not a policy. There's nothing in Netanyahu's litmus test that suggests what end-state he prefers. Does he think continuing the occupation indefinitely is viable? Would he support some pathetic joke of a Palestinian state with smaller-than-1967 borders and without East Jerusalem? Does he back population transfer, like Benny Elon, or exchanging settlements for Arab Israeli areas, like Avigdor Lieberman? Really, there's is no shortage of non-viable, right-wing "peace plans" out there. If Netanyahu is to bash the API/Geneva/Taba consensus, he should pick one of them and run with it, or roll his own. Otherwise, there's little in his platform but obstructionism. Most Jews, inside and outside of Israel, identify broadly with a two-state solution. Which is good. But this commitment, if it is to be taken seriously, has to be backed up with some sort of concrete plan for attaining it. It's not enough to vaguely say "I want peace". There has to be a there there. This hit home with me thinking about my identification with J Street and the need support American policies which concretely advance the cause of peace. Denigrating J Street as a "fantasy", a colleague of mine (whom I won't name, but who is free to identify herself if she wishes) expressed support for a two-state solution, but told me that the United States should not pressure Israel in any way, shape, or form to move in that direction. This, to me, is not supporting a two-state solution -- at least as a matter of American foreign policy. It's supporting an American foreign policy of allowing Israel to do whatever it wants, regardless of whether it gets us closer to a peaceful and just resolution of the conflict or not. As far as I'm concerned, adapting that position is simply inconsistent with being "pro-two-state solution". I honestly don't think someone who is unwilling for the United States to ever challenge Israel to do something it might be reluctant to do can reconcile that with pro-peace commitments. Hell, I don't even think that's reconcilable with being pro-Israel. Sometimes even friends require a little bit of leaning on. If you're unwilling to do that, you're not a real friend. Supporting peace in the middle east means supporting a viable plan to get us there. Obstacles to peace exist on both sides. I happen to think the more serious obstacles come in the form of Palestinian anti-Semitic ideology and terrorism. If you support a two-state solution, you have to have a policy agenda that meaningfully reacts to (and allows Israel to meaningfully react to) this violence and incitement. A concrete step that all players (Israel, Palestine, the EU, the UN, America, and the Arab League) should be taking is cracking down on maximalist ideologies which are poisoning Palestinian civil society and making peace impossible. There is a reason why UNRWA textbooks are considered a big deal in Israel -- they're an abdication of the UN's responsibility to try and dissipate, rather than fan, the flames of extremism and create the conditions where peace can occur. I'm not that interested in the psychological or social reasons why some Palestinians might buy into hateful ideas about Jews, or be reticent to adopt an outlook hinged on mutual equality and respect. Descriptively, that might be the state of affairs -- but that's all the more reason why the actors working to create peace have to break down those mentalities, not ignore them and let them fester and multiply. But the Israeli settlements are major obstacles as well -- and ones that really serve no purpose but to aggravate Palestinians and make it more difficult for peace to be achieved in the long run. If you support a two-state solution, then, you need a plan which actually will see most if not all of the settlements dismantled in the foreseeable future. Simply waving your hands and saying "Israel will deal with them" is not a plan. It also shows a shocking ignorance of Israeli parliamentary politics, which makes evacuation of the West Bank settlements unbelievably difficult without external pressure even though it'd be supported by a popular majority in Israel. The US has the leverage to help break this stalemate and strike a huge blow for peace. It needs people who are willing to mobilize on behalf of Israel to put their money and politics where their mouths are, and press America to intervene on the side of Israel and Palestine -- which is to say, the side of peaceful co-existence. As Matthews says, there are alternative right-wing "plans" for peace out there that compete with the framework I believe in. I don't particularly think any of them are viable, and I think many of them would exact unbearable costs in terms of violation of human rights of innocent civilians. But in some ways I actually prefer people who advocate for those proposals, because at least they are owning a position that can be analyzed and critiqued. While a larger part of me prefers those who at least theoretically prefer two-states than "Greater Israel" or binationalism, because I think their end-point commitments are on the mark, saying you support a two-state solution (or some other peaceful solution) while refusing to support any concrete steps that might actually take us there is cowardly, and it is not what Israel and Palestine need right now. What Israel and Palestine need, right now, is active engagement that can create the conditions where both sides can make the requisite changes in their behavior to create justice and peace. Palestinians need to renounce terror, anti-Semitism, and maximalist ideology that demands destruction of Israel as the end-goal of the conflict. Israelis need to evacuate the settlements, commit themselves to negotiations as the primary method of engagement with the Palestinian people, and abandon the "Greater Israel" ideal which contemplates permanent dispossession and occupation of the Palestinian people. All of these steps are in some ways politically perilous, all of them are risks. The actors need to know that the United States will have their backs as they take the tough steps on the road to peace. They also need to know that if their counterparts hesitate, the United States will move swiftly to keep them on track. If you're not willing to support America actively intervening to forge peace in the region, or at the very least not willing to support some practical plan for getting Israel and Palestine to meet their obligations to one another, you're not pro-peace. Period. So What Is Different About Sri Lanka? Harry's Place is comparing the situation in Israel with that of Sri Lanka, and wondering why the former gets so, so much more attention than the latter. The parallels do strike me (and they did before I read this post), but I will freely admit that my knowledge of the conflict there is limited (though not non-existent). So I am curious. What do people think accounts for the difference in the relative attention? 1) Israel is more closely associated with the United States and the West, making it an easier target. 2) The Sri Lankan conflict is seen as "intra-mural", that is, between two "native" groups (Tamil and Sinhalese), whereas in Israel/Palestine one side (the Jews) are seen as foreign interlopers. 3) Anti-Semitism: People prefer to yell about Jews more than other groups. But again -- I concede my knowledge is limited, and I am quite open to hearing why others think the disparity exists. We had our first continent with South Africa. Venezuela expanded us into South America. And Europe? Well -- there is a lot to choose from. In Iceland, a Bicycle shop is displaying a sign: "No Jews allowed", apparently as a "solidarity" measure with the Palestinians. This comes as protesters are demanding that the Icelandic government cut diplomatic ties with Israel. In Norway, a politician who attended a pro-Israel rally is now under 24-hour police protection. "I have never experienced this kind of hatred in Norway," said [Asle] Toje [foreign policy adviser to the opposition Progress Party], who was present at the demonstration. "There were people throwing stones at and spitting on rally-goers. Afterward, people carrying Israeli flags were randomly attacked in the streets." A Norwegian diplomat in Saudi Arabia made waves recently for claiming that "The grandchildren of Holocaust survivors from World War II are doing to the Palestinians exactly what was done to them by Nazi Germany." Once again -- exactly? I think the history here seems a bit sketchy. Israel has already done enough to show that even with Madoff the Pharisee in jail, the U.S. will continue to have faith in Israel, in spite of having committed all manner of crimes against humanity. I would be fascinated to know how this "man of God" thinks "Madoff the Pharisee" and America's relationship with Israel are remotely connected. Except, I suppose, that Madoff demonstrates that Jews can't be trusted. Though since I'm reasonably confident based on current events that the Catholic hierarchy will take no action against Domingues, it is hard for me not think that the Catholic church (as an institution) can be trusted to respond to anti-Semitism.